1. Copy all files, including the images they are referring to. 2. It's a good idea to enable the Let WYSIWYG Web Builder manage images and other files used by a project option in Tools|Options|Folders, so you automatically have a copy of all your images and other assets in your My Documents\WYSIWYG Web Builder\ProjectName folder. Where 'ProjectName' is the name of your project. If you do not enable this option you will have to manually locate and copy the files used by your project! My Documents\WYSIWYG Web Builder folder to CD and it should load ok on another computer. 3. Another way to transfer a page is to save as template. A template is an archive of the page including all images and other objects. Then open the template on the other computer. 4. If your project uses special fonts that are not part of the standard Windows installation, you must also copy these to the other computer! If you are using extensions in your project, you should also copy the images used by these extensions from their original locations. Images used by older extensions are not saved in /images folder. If the images (and other assets) are in a different location on the other computer then you can also use the Asset Manager (Menu->Tools->Asset Manager) to quickly update the path. Last edited by Pablo on Sun Aug 15, 2010 7:30 am, edited 1 time in total. 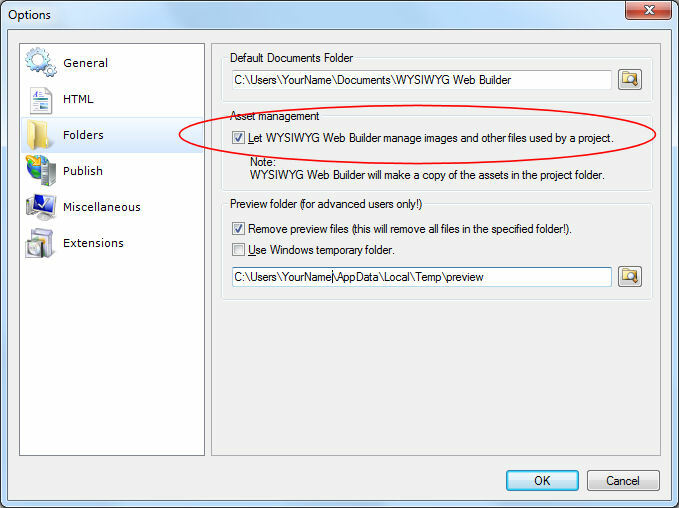 In WYSIWYG Web Builder 7 and later all user specific files (extensions, publish settings, templates etc) will also be saved in My Documents folder (My Documents\WYSIWYG Web Builder). This make it much easier to copy all your Web Builder related files to another computer. All you will have to do is copy the entire 'My Documents\WYSIWYG Web Builder' folder to the new computer. Re: How to copy a project from one computer to another? regedit allows you to export and import the settings.